Here’s my first column as an an intern with Awoko newspaper. Like previous interns here, I’ve been assigned a daily column, in addition to accompanying Awoko reporters while they report on stories, and eventually writing and reporting my own stories. At first I found it hard to believe I could write a column every single day, but after being here less than a week, my head is swimming with ideas, and I doubt it will be too hard to think of things to write about. Going on a reporting trip up to the north this weekend with Awoko staff gave me at least three column ideas, and so many threads of ideas to look into further. I saw my first rainfall in Freetown this morning while I was sipping tea in the dining area of my hostel. It soon became intense, hammering on the tin roofed houses just outside. Before too long that morning, I was running through it to and from the car, naively trying not to get too wet as it poured from the sky. Today I met the wonderful staff at Awoko and got an introduction to what I’ll be doing for the two and a half months while I’m here. And I’m writing this in the Awoko office, having just come back from walking around the block. 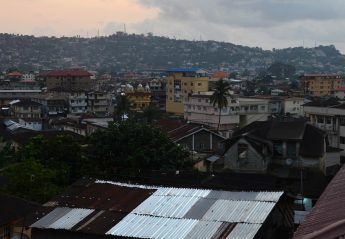 It was the first time I actually set foot in Freetown and saw it from the ground. So, a few important firsts today. Ever since my plane touched down in Lungi Airport the day before yesterday, and I stepped outside into sub-Saharan Africa for the first time, there’s been a lot for my body, my senses, and my mind to process. Whatever country I travel to, it’s the scenes I encounter during the first few hours that really stick with me. For Sierra Leone, I’ll remember walking outside the airport and seeing the striking red soil of the road. Washed with rain, it turned the potholes in the road into pools of pigment. I’ll remember the bustling commerce just outside the airport as I was shown by an airport worker to some unofficial money-changers, the sight of nearby palm trees and tin-roofed houses, and the sounding of the Islamic call to prayer. I’ll remember the bus ride to the boat dock, past more bare-bones houses, a young girl standing outside on the porch pouring water, and then, while waiting for the boat to take me across the water to Freetown, a golden sunset on the dark beach.